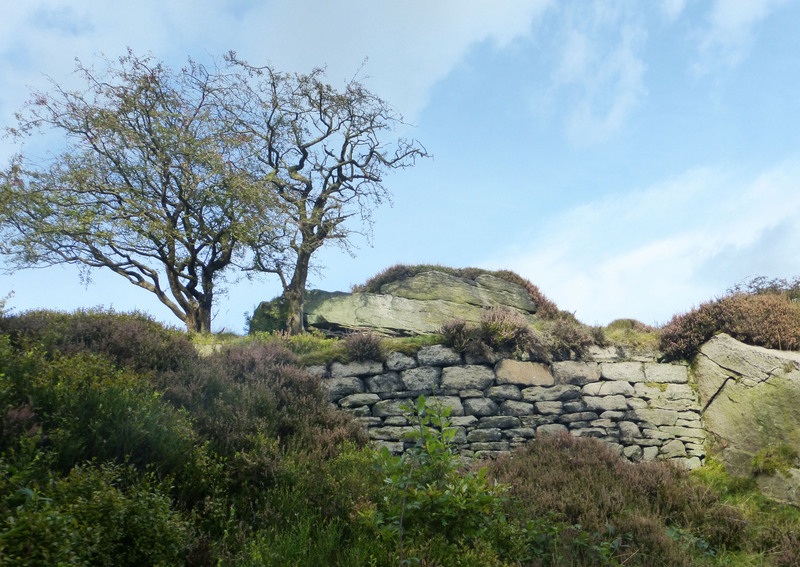 A last-minute change of plan on the last Sunday of August entailed a rush to catch the bus up to Blackshaw Head for one of our regular walks into Jumble Hole Clough. The driver failed to stop at the usual place and we alighted at the corner of The Long Causeway and walked back onto Badger Lane. 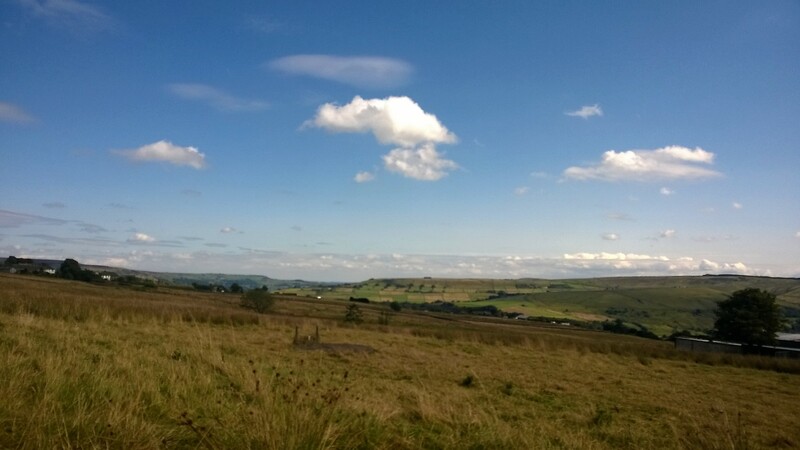 Taking our usual route down to the clough via the path signed ‘Calderdale Way’, we paused at Apple Tree Farmi to watch the alpacas frolicking with a friendly dog and gaze at attractive clouds scudding above Stoodley Pike. 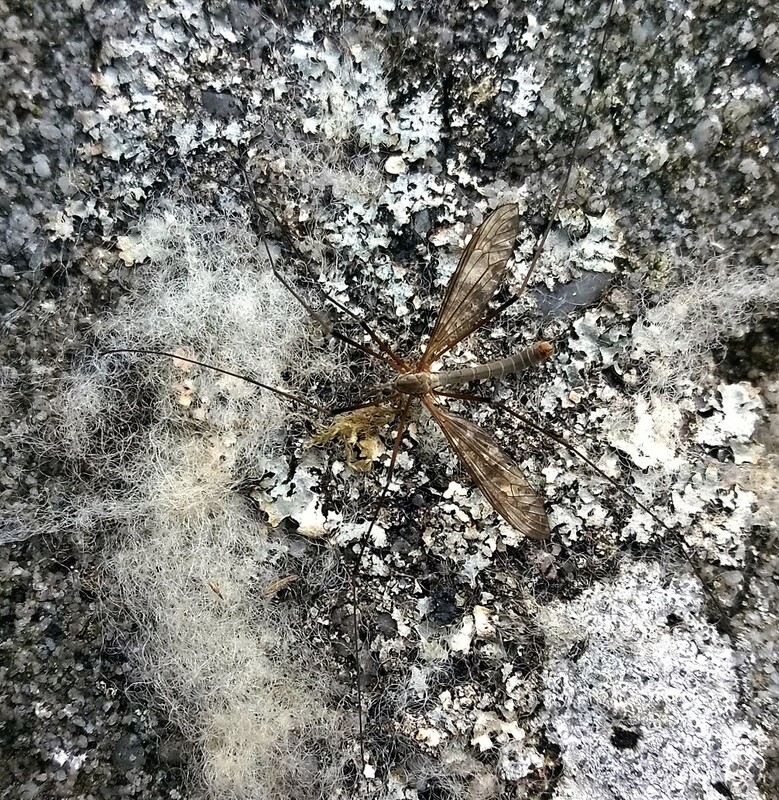 At the meadow, we rested on the flat rock and it was only after several minutes that I noticed a crane fly right next to me – its grey colouring was perfect camouflage against the granite. We crossed the bridge and walked down to Staups Mill where we lingered awhile. Climbing the stony path up, we veered down to the left, following a sign. This led us through a mini forest, past small disused quarries and picturesque boulders creating a gateway to a junction we recognised. Turning left again we arrived at the clapper bridge. Hungry by this point, we stopped here for a small picnic then continued climbing up to the ruined hovels. Another sign pointed up steps atop the ruins. Curious, we took a detour to find attractive stiles and trees. Emerging in a field, I wondered if we’d stayed ‘up top’ we could have reached this point from the first field we entered. We came back down to continue homeward. At the mini moor, we needed another rest to recover from our climb. 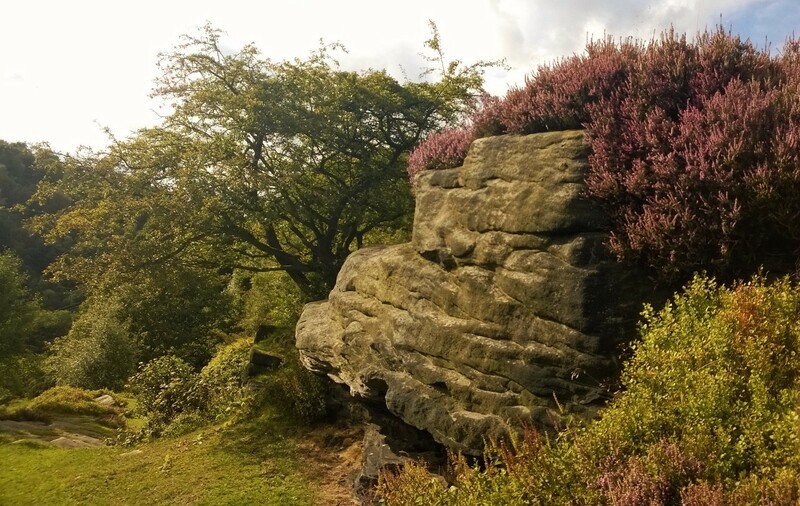 I clambered the rock festooned with heather, reflecting that it had become much more overgrown since our early visits. We continued down to Mount Olive chapel and onto the Pennine Bridleway. On the descent, we spotted quite a few ripe blackberries t pick. As the bridleway became cobbled, we said hello to a man working on his porch and paused again on the nearby broken bench. Continuing down, we turned left onto a smaller path and followed it to ‘Wood view bridge’. We crossed the road and onto the canal for a quick return home. This entry was posted in heritage, landscape, photography, walking and tagged alpacas, Apple Tree Farm, Badger Lane, Blackshaw Head, bridge, Calder Valley, Calderdale, Calderdale Way, clapper bridge, clouds, clough, crane fly, Davey Lane, England, Hebden Bridge, industrial heritgae, Jumble Hole Clough, landscape, moor, path, Pennine Bridleway, photography, quarry, Rochdale canal, ruins, seasons, sky, stones, summer, walking, Yorkshire on August 30, 2017 by Hepdene Rose. The day after our trip up to Midgeley Moor also started sunny. We packed a picnic and caught the bus up to Blackshaw Head. Alighting at the last stop on the Long Causeway, we walked up the road to Harley Wood Gate Farm in search of a path leading to the top end of Jumble Hole Clough. Passing scruffy sheep and ramshackle ruins, we found a public footpath sign pointing to the farmhousei. As we approached, a man gardening intercepted us. I said we were looking for the marked public right of way. He directed us round the house and through a bog! 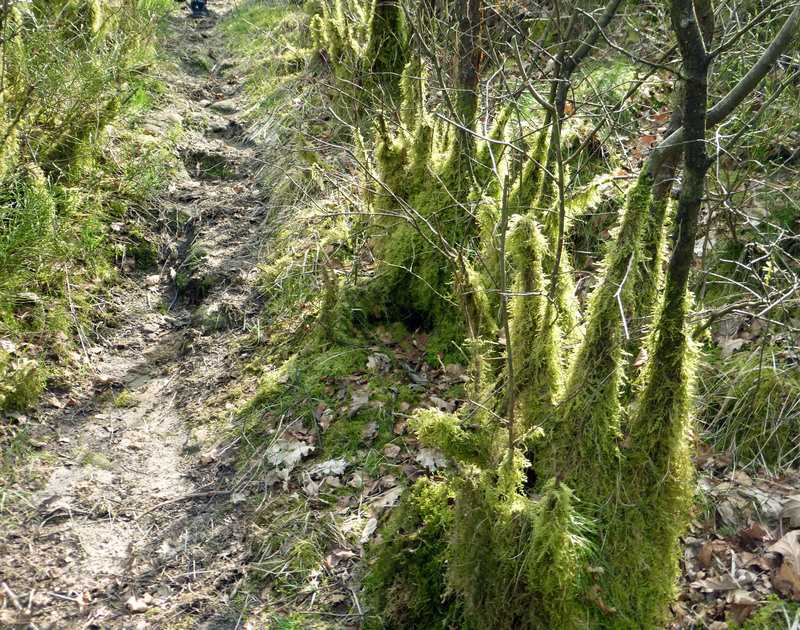 We picked our way through tussocks and more bog, following the path first West then South. Because it was not always clear, we made sure of the next stage of the route before continuing over each field. Eventually we were thwarted by a fence that had been put up in front of a stile, beyond which even worse quagmires lurked. Retracing our steps, Phil managed to step into a swampy hole, soaking his sandaled feet (making me glad to have persisted in wearing sensible boots). On the way back, I took photos as evidence of the obviously deliberate ploy to put walkers off. I refused to cross the bog in front of the farmhouse and walked on the path through the garden. There was no sign of the man. We returned back down the causeway to Davey Lane. This led easily to the clough, via Bullion Farm (Phil insisted on calling it ‘Bull Lion’ farm), the familiar stone trough, the friendly alpacas and the attractive field above the clough. Here, we noticed some deliberately-placed stones for the first time; as if someone had started building a bridge but gave it up as a hard job. We made use of the flat rock for our picnic. It had become rather windy. 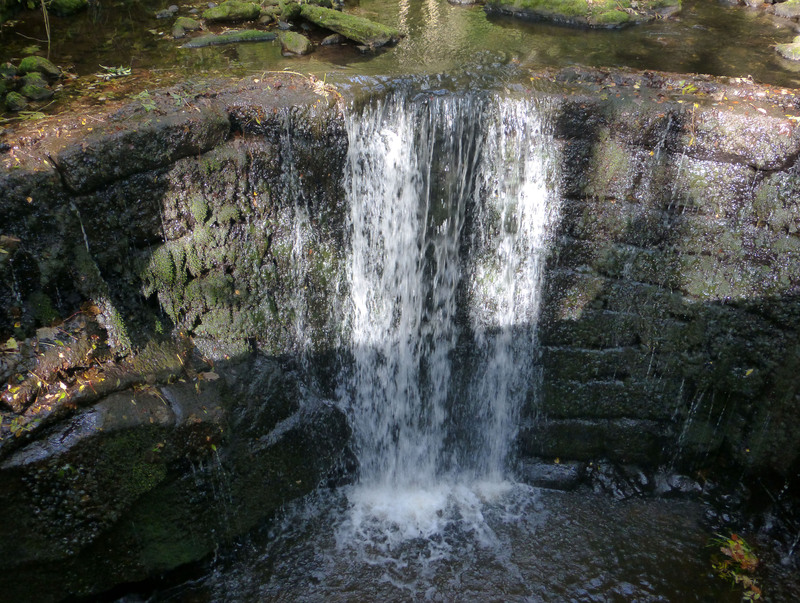 We took the steps down, bedecked with yellow flowers, and crossed the sloping stream into the sheltered clough. At Staups Mill, two couples stood around chatting, hampering our photography. Further down the clough the tree line opposite resembled clouds as they sprouted new growth. We took a path down on the left to the small clapper bridge, pausing to admire wood anemones. We then climbed up to the ruined hovels and imagined the grim lives of those who once dwelt there. With careful footing, we found our first bluebells of the year and an excellent crop of wild garlic to pick. As we rested on a nearby wall, mist appeared across the valley. The air became decidedly chillier as if a storm was a-coming. Keen to return to civilisation, we carried on climbing to the higher path, then South along the ridge. When the PBW ii became steep, we veered off to the left along a smaller path edged with flowers and hawthorn blossom. Emerging at Wood View we noted the ‘danger balsam’ sign indicating poisoning had taken place in the futile battle against the plant. We crossed the road and metal steps onto the canal towpath, walking home fast as the air had become even more chilly. i The next day, Marisa said she knew the dodgy path we had attempted and told us that a better route to the top of the clough could be found further up the Long Causeway. This entry was posted in heritage, landscape, photography, walking, woods and tagged alpacas, Blackshaw Head, blossom, bluebells, bog, bridge, Bullion Farm, Calder Valley, clapper bridge, clouds, clough, Davey Lane, England, farmhouse, fence, fields, flowers, foraging, garden, Harley Wood Gate Farm, hawthorn, Hebden Bridge, Himalayan balsam, hovels, Jumble Hole Clough, mist, path, Pennine Bridleway, photography, public right of way, quagmire. 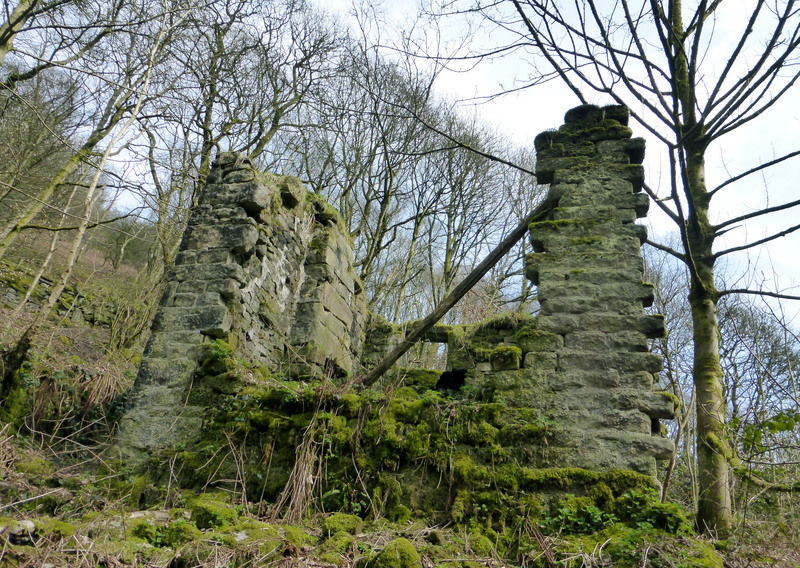 tussocks, ridge, Rochdale canal, ruins, sheep, Staups Mill, steps, stile, stones, The Long Causeway, towpath, trees, trough, valley, wild garlic, wood anemones, Wood View, Yorkshire on April 14, 2017 by Hepdene Rose. A mid-October ramble started with an easy walk along the canal to Callis Bridge. Crossing the road, we turned right up Jumble Hole Road then followed a path on the left side of the stream. Amongst the very pretty trees and undergrowth we spied a number of old broken down buildings giving the impression that this was once a village in the industrial era. We came to the remains of a mill confirming this view. With no way to carry on up the left side of the stream, we crossed via a bridge running parallel to a stunning waterfall. We then ascended a steep tarmac path before veering off onto a smaller path back along the route of the stream albeit a lot higher up. Further on, we had a choice of several forks in the path and took one going down to a cute stone bridge we knew well. Traversing the stream once again, we climbed up to a different path leading back down towards the Pennine Way. The steep climb and lack of stopping places rendered us in severe need of R&R (rest and refreshment). We sat on a flat rock which had become so overgrown that it resembled a mini moor. After a picnic, we embarked on the last part of our ramble. This involved a steep descent making us footsore. 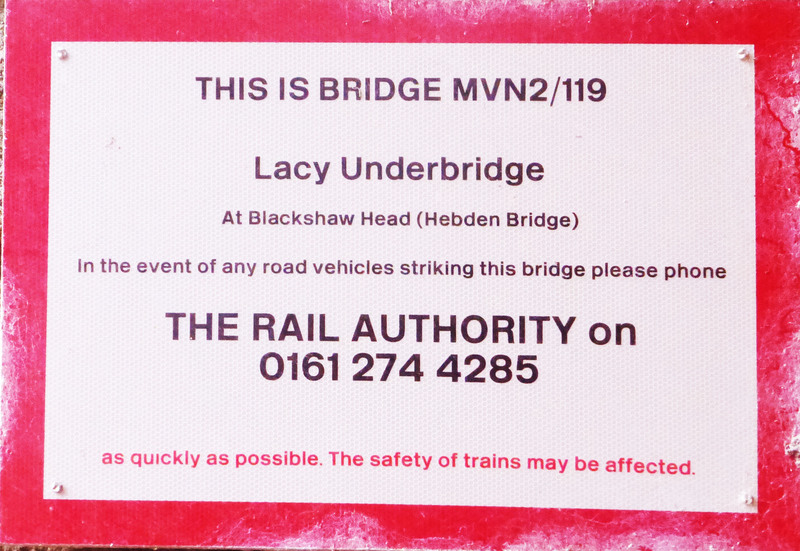 However, we still managed to laugh at the sign for ‘Lacy underbridge’ as we emerged back onto the main road! Visiting the clough again the following April, we noticed that some of the old ruins had been demolished, but we found a tiny house to explore. Taking care not to sink into the several inches of mulch, we marvelled at the small dimensions including the very low ceiling that must have been in place judging by the evidence remaining. After crossing near the waterfall and climbing up the valley side, we turned left up a different path than last time, which took us through a strange ‘Pikachu’ woods . Moss had grown round the bottom of all the trees creating weird animal-looking formations. Following a steep climb, we eventually came out onto a grassy lane. We took a somewhat circuitous route via a dodgy path to Great Rock where we enjoyed lovely views and a picnic. 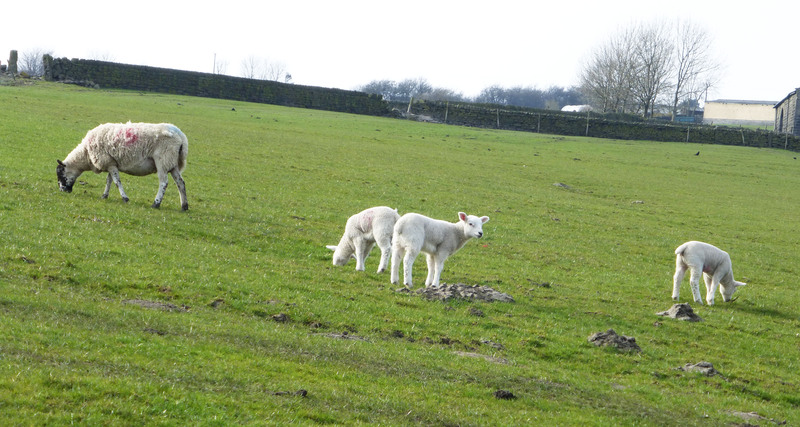 We then walked down a very pretty road, with spring lambs aplenty. 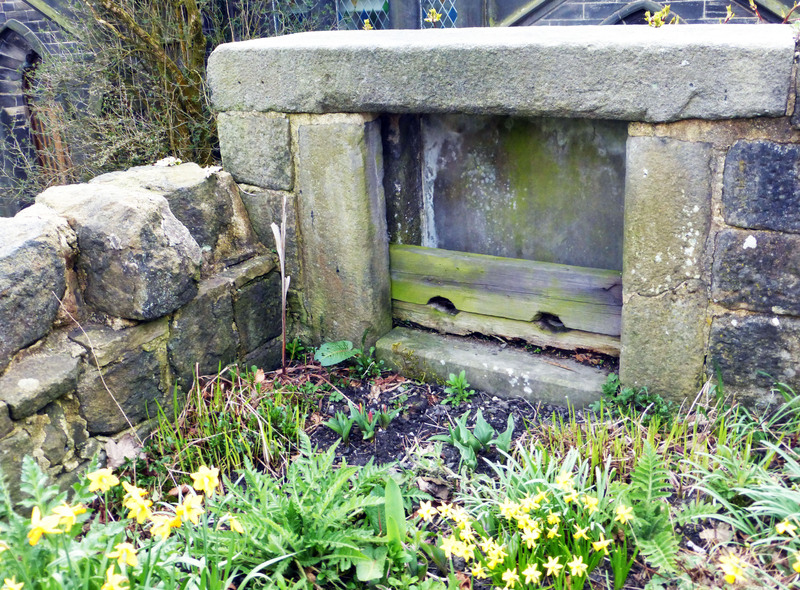 At the village of Cross Stones, we laughed at the stocks and wondered if they were still in use, before walking the rest of the way down to the bus stop. An alternative route into Jumble Hole cCough involved catching a bus with a friend up to Blackshaw Head. Alighting near the graveyard, we walked down following the’ Calderdale way’ signs. This took us along small paths. Somewhat overgrown in July, the stone paving rendered them still navigable. I picked wild grasses and stopped to look at stone troughs, wild flowers and unexpected llamas. We turned left at a wooden gate and traversed a field of sheep down to a wooden bridge into the clough. We crossed the bridge and followed the path along the streamto Staups Mill. 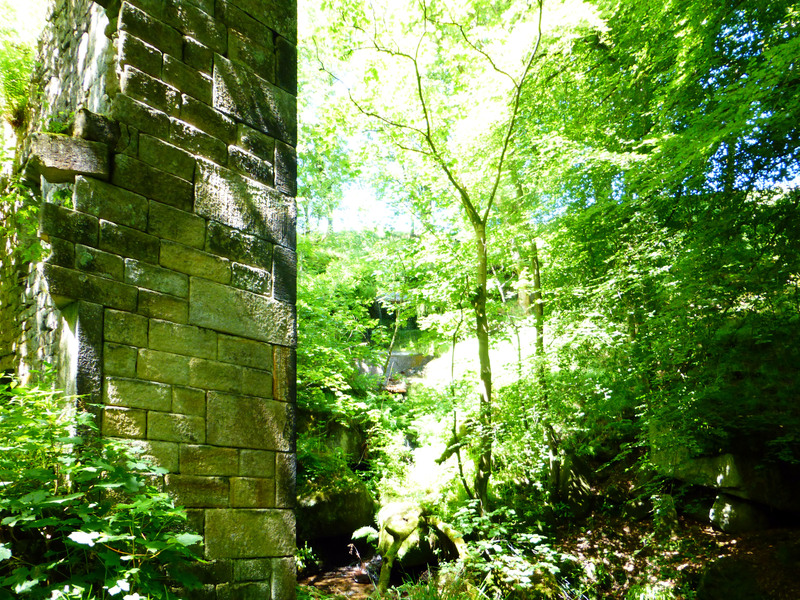 After a picnic, we continued down the clough and back across the stream at the arched bridge. 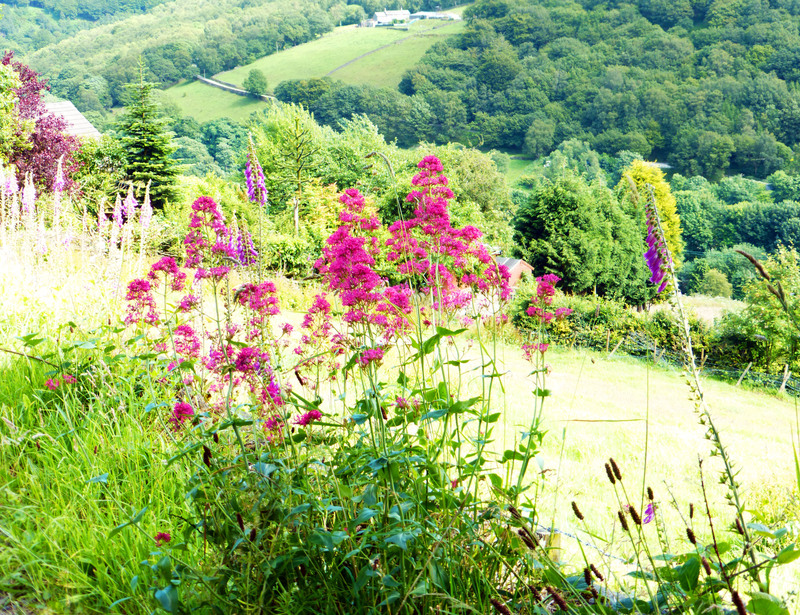 From there we climbed towards the Pennine way and along smaller paths homeward, admiring the lovely hedgerow flowers along the way. Later in summer, I took my partner the route my friend had shown me. 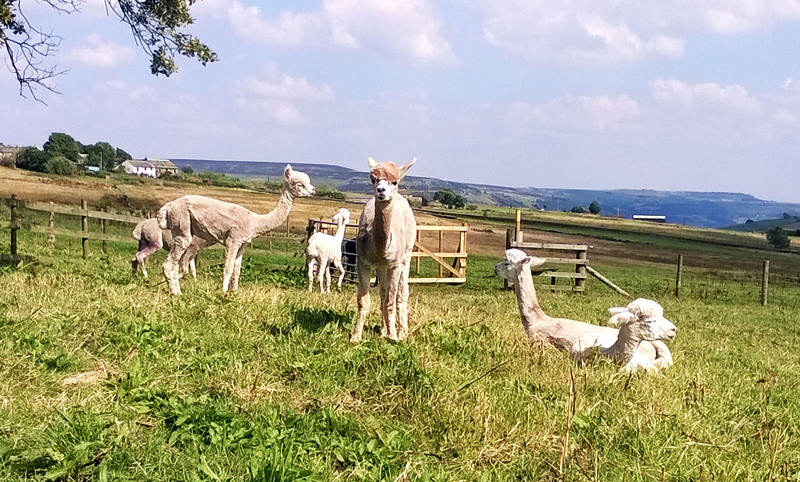 We admired colourful flowers, long grasses and curious alpacas (with babies this time) on our way down to the clough. We stopped in the lovely meadow above the clough lingering to take in the scenery. 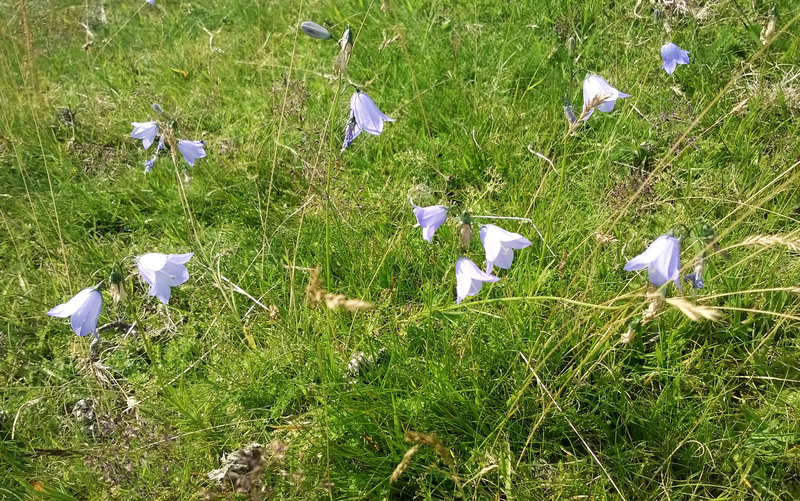 Delicate harebells contrasted with the lush grass. We then crossed the bridge and along the path to Staups Mill. From there we decided to take a new route going downwards which eventually led to the cute stone bridge in Staups Clough. Again we chose a different, lower, path to the usual. We expected it would eventually lead back up to the path with the ‘mini moor’. It didn’t. Instead, we found ourselves following a narrow, overgrown path almost at the top of the tree line. A veritable jungle in places, we had to watch our step. Eventually it led down to the paved path we knew. Tired form the effort, we stopped at the graveyard at the now-ruined Mount Olivet Chapel before continuing down. This entry was posted in landscape, photography, walking, woods and tagged autumn, bridge, England, England. 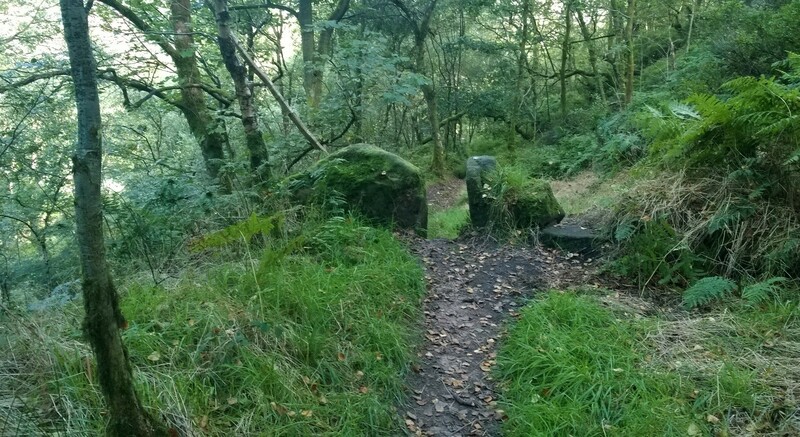 Hebden Bridge, flowers, Hebden Bridge, Hippins Bridge, Jumble Hole Clough, llama, moors, path, Pennine Way, river, Rochdale canal, rocks, ruins, sign, stones, summer, trees, walking, waterfall, woods, Yorkshire on October 22, 2014 by Hepdene Rose.